See where you’re going and how you’re going to get there. 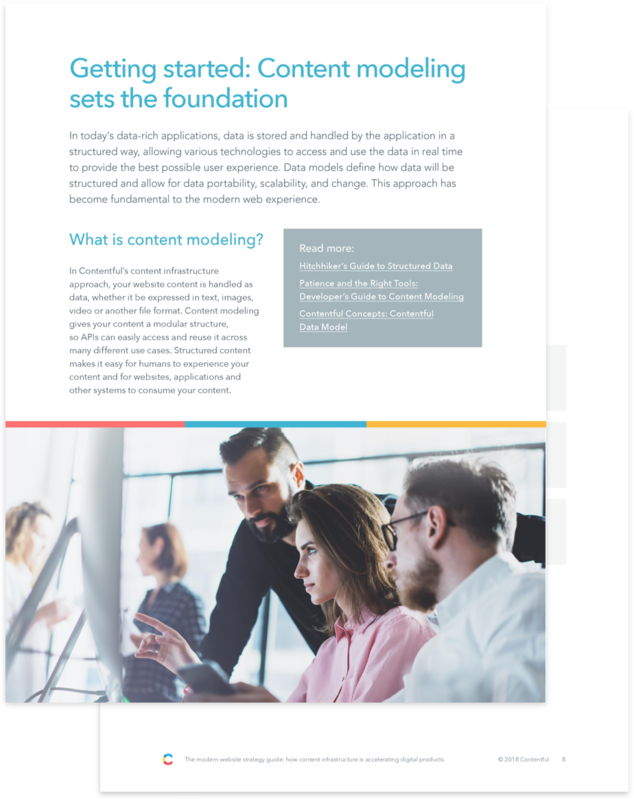 This white paper guides you through the basics: content modeling, integrating with your delivery pipeline, and managing the complexity that comes with scaling. We’ll give you the steps to get set up, but what you do from there is up to you — there are no limits. Make the content model to fit your website’s content, not the other way around. Learn how Contentful treats your content as data, allowing APIs to easily access and reuse it across different platforms. Practice continuous integration and continuous delivery where all members of your team can work in parallel. Start with a platform that believes you’re going to grow. Scale effectively and painlessly with Contentful’s structural tools and infrastructure. "“Contentful supports powerful content modeling primitives as code and content model evolution scripts, which allow treating it as other data store schemas and applying evolutionary database design practices to CMS development.” "